Fantail Mill is a wonderful complex built to resemble a old NZ rustic timber mill town, with a beautiful furnished cottage. A private balcony offers amazing views and sunsets over the teal blue waters of Orongo bay. The quaint cottage has a double bunkbed and a queen bed in the open living area. The "barn" is ideal for groups as you can gather in the evening for a chat and a drink. The cottage also has the free guest laundry. We provide a stunning outdoor kitchen, set amongst the native bush with full barbecue and 4 burner gas hob, kitchen sink and all the amenities. The cottage has a kitchenette. Fantail Mill offers people a wonderful retreat away from the hustle and bustle of the modern world, but is only a short drive to the historic seaside village of Russell. Nestled into 1.5 acres of sloping coastal land with stunning sub tropical gardens, Cape Cod chairs scattered under the shady canopies of the ferns and bush, which is filled with the song of wonderful bird life including tui, fantails and weka, and at night, calls of the morepork and kiwi can be heard. 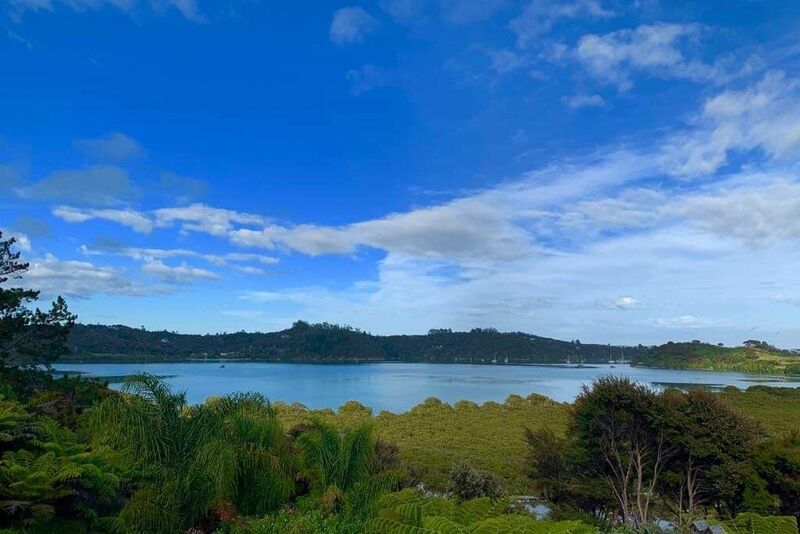 Four beautiful beaches and two wineries are within an 8-minute drive of Fantail Mill and a 510 m boardwalk, which is part of the Okiato to Russell walking track, is accessible directly in front of the property. It takes around 40 minutes to walk into Russell, but around a 3 to 4 minute drive to the cafes and restaurants. A service station which sells supplies is only 200 m along the road. William and Tracy look forward to meeting and looking after you when you stay at Fantail Mill. There is no smoking in the studio but you may smoke in the areas provided. We bought Fantail Mill in September 2016. I fell inlove with the place and as we wanted a lifestyle change, decided that this was the spot for us. It is important to us for people to enjoy their stay with us and where better than Russell - the gateway to the beautiful bay of islands. We are located 3 km's from Russell in Orongo Bay. Everything is close but away from the crowds in high season. We love our spot and want to share our piece of paradise. A 510m board walk crosses the bay directly in front of Fantail Mill with a view of fish underfoot. The place is stunning and such a beautiful place to stay in you're near Russell. The place is stunning and such a beautiful place to stay in you're near Russell. They provide more than you'll ever need and loved the outdoor kitchen. I couldn't recommend it enough if you're need some quiet time away from the hustle and bustle of the city. The Fantail Mill is a place that I will return to over and over. More of room with a view, than a bach. More of room with a view, than a bach. It is beautifully decorated, but too small for more than an overnight stay. As someone else has said, there was nowhere to put our luggage. The kitchen area is also tiny, though there is another kitchen provided in the grounds, and a communal social room. We live in Orongo Bay which is 3 km's from the Russell Village. There are many attractions available to people visiting. Sailing, fishing, walking, island trips, discovering Russell or simply enjoying the beach. In front of our property is a board walk amongst the mangroves. There is no shortage of restaurants (The Duke of Marlborough & Gables are my favourites) plus we have two wineries close by which are well worth visiting. In our garden you will see Weka birds and at night we often hear the call of Kiwis.